Light fixtures should be clean on regular basis so that you will get sparkling and crystal clear fixtures all the time. But if you are not able to do so on regular basis, clean them at least once in a week for sure. You can use any of the below mentioned methods to clean the light fixtures and chandeliers. Cleaning tips for crystal chandeliers: Crystal chandelier looks very beautiful but also very delicate to handle. It should be cleaned for better sparkle one daily basis. But we all know it is not possible to clean them regularly. You can use any of the below mentioned Cleaning tips to clean a crystal chandelier which makes your work easy. But do not forget to follow the safety measure mentioned at the end of article while cleaning the electrical appliance or light fixture. 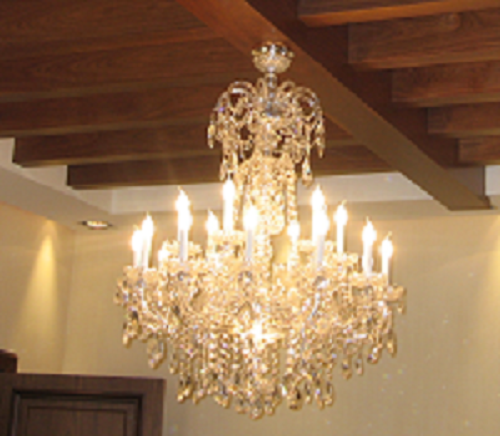 - You can clean the crystal chandeliers by using Wet method if it is very dirty or have some greasy stains. First of all turn off the electricity to the fixture before cleaning it and allow the bulbs to cool down. Spread some thick towels on the floor beneath the chandelier to protect the flooring from the excess solution that may drip during the cleaning procedure. Remove the bulbs or cover the bulbs and sockets with small plastic bags to prevent moisture from entering the sockets. Spray the liquid cleaner or just plain water on the entire light fixture (use only spray method instead of using any cleansing agent or water directly on chandeliers). Wipe the fixture with the wet dishcloth to remove grease and accumulated dust. Dry with the drying cloth when the fixture appears to be clean. -	Dry method to clean the crystal chandeliers can also be used if you're cleaning them on regular basis. To do so just rub the chandeliers with some soft towel and see how all dirt will comes out. -	You can also clean the crystal chandeliers piece by piece. Remove the parts of the chandeliers that come off easily like bulbs, globes and shields. You can remove the dangling glass crystals on chandeliers but don't remove the entire fixture since you can clean the metal parts in place. After removing the parts wash the glass crystals under the hot water with little amount of soap or any other cleaning agent but don't immerse light bulbs, wipe the bulbs with a damp cloth and let them dry. Dry each and every part and reassemble the chandelier. Cleaning tips for light bulbs: To clean the bulbs use clean sponge. Dampen a clean sponge and gently wipe away dust and grime from the bulb to get clean and shiny bulb. Cleaning tips to clean sockets: To clean the sockets take out the bulbs and carefully sand the electrical contacts. Blow out the dust, and reinstall the light bulbs. -	As well know that Ammonia is a good glass cleaner and grease remover so you can use ammonia to clean the crystal chandeliers. -	Some people do not like the odor and smell of ammonia so you can use white vinegar or alcohol as alternative cleaners to clean the crystal chandeliers. -	Do not use very hot or cold water to clean the glass fixtures as sudden temperature changes can break glass. -	Never ever use water to clean the electric sockets or don't get the socket ends of the light bulbs wet. -	Do not mix chlorine bleach and ammonia as they give toxic fumes.